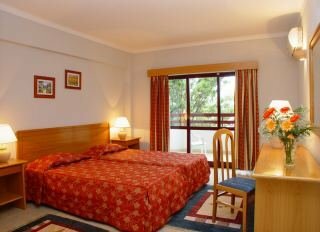 This hotel enjoy a very good location, in the centre of Lagos and close to the main beaches and very good value for money. DDS 07/08. Ideal Location to visit Albufeira and the Algarve. Many facilities on offer: bar and lounge with games, billiards and table-tennis, tables and large-screen projector TV; health club, jacuzzi, sauna and gym (supplement paid locally). There is also a private.. The hotel is located 1 km from Luz town center, 1.5 km from the beach and 7 km from Lagos town. Facilities and services include a breakfast room, snack bar, outdoor pool, children pool, wireless Internet in public areas and parking. The rooms are equipped.. 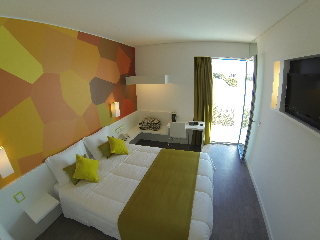 Located jsut 500 away to Faro Airpot with easy access to the city center and another locations in the Algarve.51 rooms well decorated rooms equipped with private bathroom, flat-screen TV air conditioning and a balcony. Also Free Wifi is available.there..
General Description: Acqua Maris Balaia in Albufeira has 113 rooms, spread over 6 floors. The hotel is located 450 m from the sandy beach. The closest cities to the hotel are Vilamoura (18 km) and Armacao (15 km). To make your stay more comfortable a.. The Agua Marinha is a charming family-run property situated on the outskirts of the picturesque fishing village of Olhos d¿Aqua, on the sundrenched Algarve coast. The village centre is around 800 metres away and its charismatic cobbled streets host..
Aparthotel "Alagoa Azul T1". In the centre of Altura, 100 m from the sea. For shared use: swimming pool (01.01.-31.12.). In the house: internet access, lift, air conditioning, bicycle rental. Towel change 2 times per week. Room cleaning 6 times.. This charming beach aparthotel is located in the leisure district of Montegordo on the renowned Algarve. The complex is situated just 300 metres away from the sprawling kilometre-long sandy beach, along which guests can enjoy leisurely strolls or simply..
Alba is situated just 400m away from the beach. Alba is located only 400 m from the beach. Hotel facilities include swimming pool, bar, TV room, restaurant and laundry service. All apartments are equipped with bathroom, A/C, telephone, TV, refrigerator,..